The Chicago-born rapper has been heralded as a master lyricist. His first mixtape, titled “Earl,” was released back in 2010 when he was 16 years old. After a brief pause in his music career, he returned to Los Angeles in 2012 to rejoin Tyler the Creator in the American hip-hop collective, Odd Future. “Some Rap Songs” seems to be a departure from the sound he developed in his early days with Odd Future. In this album, Earl confronts themes of mental health and a series of personal family issues through his signature mixture of contemporary jazz and hip-hop sounds. 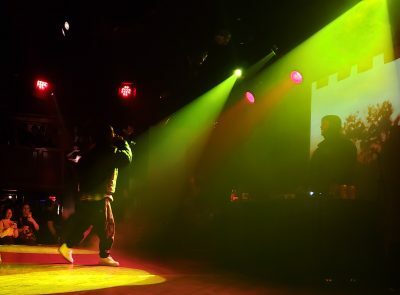 Rapper BbyMutha stepped on the stage at Paradise Rock Club before Earl Sweatshirt to deliver a powerful, bass-heavy opening performance. It was refreshing to have such a strong female opener to balance out the disproportionately male audience. The concert was a chaotic scene of flying glow sticks and bodies jumping up and down — but it set the tone well for Earl Sweatshirt. Exactly at 9:30 p.m., he took the stage and the audience completely lost their minds. The audience’s moshing during BbyMutha’s earlier performance looked like child’s play compared to the crowd when Earl began his act. Once Earl came on, the die-hard fans in the audience revealed themselves, proudly rapping the lyrics right along with the rapper throughout the show. There was a sense of deep camaraderie among the fans and, at one point in the middle of the concert, a man named Daniel captured the attention of the artists on stage and interacted with them throughout the whole show. Earl’s performance was a marathon of songs from his new album as well as popular tracks from his previous albums. It seemed like he rarely took breaks, quickly and seamlessly transitioning between numbers. The continuous bombardment of ear-deafening music maintained the audience’s high energy, making for an unforgettable performance with unforgettable people.